I’ve ridden older models of both Powertap and Quarq. I had no oppositions to either, but wanted something modern that I could swap onto my CX bike in the fall. Its that multiple-bike flexibility that is astounding with this PM. Picture a world where one allen bolt is the only step to share an advanced power measurement device between a 130bcd, tubeless, alu-rim road bike and a 110bcd, tubular, disc brake ‘cross monster. That is the Stages world my friend. I ordered mine on 11/17. They claimed a 5 week manufacturing time on the Rival 172.5mm model I chose. Mine shipped on 12/12 so they beat their estimate. I had it installed and connected to my Garmin within 15 minutes of UPS dropping it off for my trainer sess that evening. Immediate first impression: its clear that its only your left leg behind measured. Maybe that will bother you, in which case you should look elsewhere. After two month of use (mostly indoors), I am still a little self-conscious of my power balance while pedaling on the trainer. Outdoor riding and the rollers are engaging enough that R/L power balance fades into the background of my mind. All crank-based PMs rely on some sort of internal cadence measurement to calculate power, and most of them also report this cadence figure up to your Garmin. I will say that I am not impressed with the Stages cadence measurement. It is a bit slow to react (must be averaging over a time interval), and it seems to favor certain numbers (I am forever jumping between 91 and 96 RPM, very rarely in between). 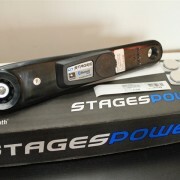 Stages uses an accelerometer to perform cadence measurement, much like the newest Quarqs. Older Quarqs had a bb-mounted magnet for cadence, which provide nicer measurement. So far so good with the Stages. It is an elegantly simple power meter. However, as it turned out, my unit was shipped with a crack in the plastic housing of the computery bits (others shared my experience, it seems a bad batch went out around the end of the year). After my initial trainer session, ride #2 was outdoors in the ever-moist Seattle. On day 3, I went to turn on my PM and — dead, kaput, no bueno. I popped open the battery cover to find some Seattle moisture inside the housing. I emailed their customer service on 12/28 and they replied on the 30th, not bad for a holiday week. They overnighted me a replacement on the same day, and since then I’ve had no issues. I award 9/10 on product design (did I mention its easy to install? ), 7/10 on data measurement (left-leg only, and subpar cadence), and 8/10 on customer service (quick turnaround, but shipping faulty units?). But more importantly than these ratings, is the fact that Stages is the democratization of power; it is to power profiling what the Edge 500 was to GPS tracking. Get ready to start talking FTP with the Fred who just tagged on the back of your team ride.